As a conservator, you can often find some rather surprising and unexpected ephemera in archive and book collections. 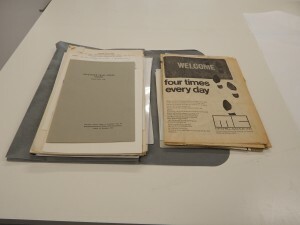 Take, for example, this folder from the University’s Aitken Collection. 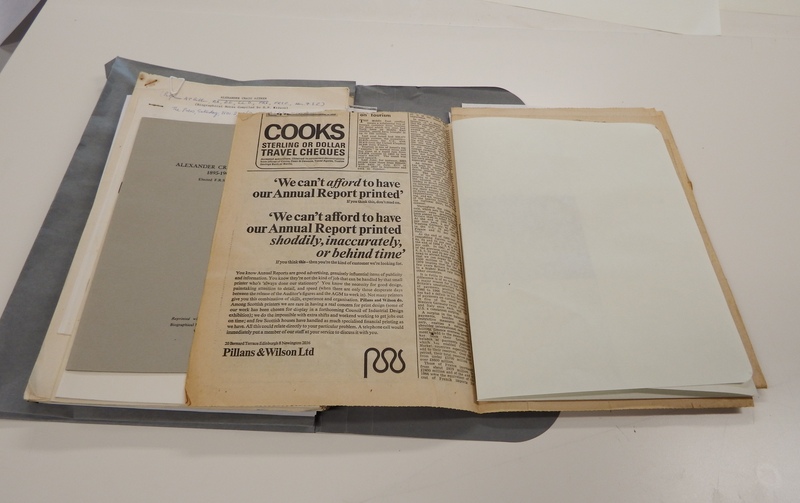 At first sight, it may seem like a fairly typical example of paper archive material. Upon closer inspection, however, there was a rather lovely surprise waiting inside. Pressed flowers are certainly not uncommon, but they can pose a rather tricky conservation conundrum; most ‘pressingly’ (pun-intended!) is whether the flowers should be left in-situ or removed and housed separately. 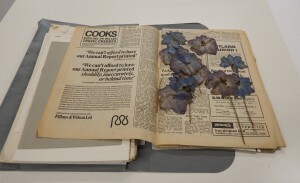 In consultation with archivist Neasa Roughan, the decision was taken to keep the flowers in-situ but re-house them in order to provide a protective interleaving layer between the flowers and archival material, thereby minimising the risk of any further deterioration. Furthermore, this will also improve access, make handling these pages easier and reduce the possibility of damage and loss to the flowers themselves. The choice of re-housing material and a knowledge of its manufacture is very important, as poor quality materials that are in close contact with collection items can cause severe damage. Acidity in poor quality materials can migrate to collection items causing discolouration and embrittlement, thereby hastening their deterioration. It was decided, therefore, to wrap the flowers in acid-free tissue, and make a 4-flap folder, also acid-free, in which to keep the flowers secure. 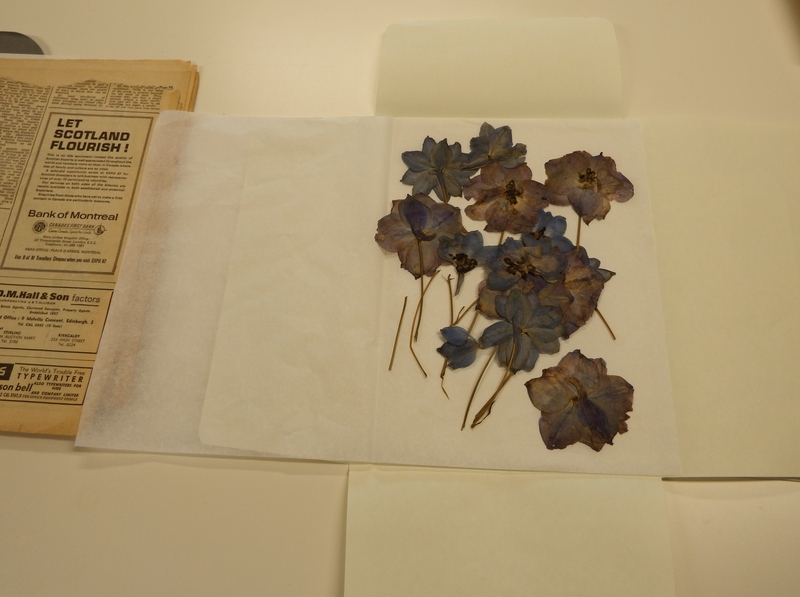 This approach allows the flowers to be kept in their original location whilst providing suitable protection to the archive material, as well as the flowers, and helping to ensure the longevity of both items. 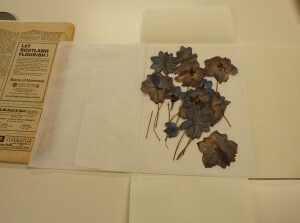 “I found these beautiful pressed anemones among the personal papers of the eminent mathematician, A C Aitken. Aitken was born in Dunedin, New Zealand in 1895; he was the son of a grocer and the eldest of seven children. Following his military service during World War I, which took him to both the battle of Gallipoli and the Somme, he moved to Edinburgh where he had been awarded a postgraduate scholarship. He studied under Edmund Taylor Whittaker, and was awarded a D.Sc. in 1925. This was something of a surprise for Aitken, who had been working towards a PhD. Furthermore, this qualification was based on a mere 10 weeks work! He kept quiet about the latter fact, as he feared that his research would not be taken seriously if it was widely known that he found his solution so quickly. Aitken progressed steadily at the University of Edinburgh, becoming reader in statistics in 1936, and gaining the chair of Pure Mathematics in 1946, where he remained until he retired in 1965. For a short time during World War II he worked at Hut 6 at Bletchley Park, though for obvious reasons little is known of his role there. Besides his prodigious mathematical talents, Alexander Aitken was gifted in many spheres. He was a talented violinist and composer, wrote poetry and prose (he was awarded a fellowship of the Royal Society of Literature for his memoir Gallipoli to the Somme) spoke six languages, and had an eidetic memory (he could recite pi to 1000 places). Sadly, he was also a rather troubled soul and suffered greatly following his traumatic experiences during World War I. His prodigious memory ensured that he was unable forget his time spent in the trenches, and as a result of this he suffered severe nervous strain and insomnia. “A picture is worth a thousand words”. As this often quoted adage alludes to, photographs have the ability to capture a moment in time. Whether they are images of stern Victorian family portraits or informal snaps of loved ones; spontaneous scenes of celebration or harrowing depictions of war and violence; shots of nature in all its glory or nature at its most powerful and destructive – photographs have the capacity to produce a wide spectrum of emotions in the viewer. It is for such reasons that photographs form an invaluable part of the collections held by the University and why it is important that appropriate steps should be taken to ensure that they are preserved for future generations. I was fortunate, therefore, to have the opportunity to attend a three day course at West Dean College in Sussex on the ‘Conservation of Photographs’, led by photographic conservator Susie Clark. During the course, I was introduced to the numerous photographic techniques and processes, which are many and varied. These range from daguerreotypes, developed by Louis Daguerre and introduced in 1839 – a date often cited as the ‘birth’ of photography – to glass plate slides, and right through to modern ink jet printing. What was clear from the outset of the course was that each process comes with its own associated conservation needs and, as a result, there is no “one size fits all” approach that can be taken when deciding on appropriate treatment options. Damage to photographs can range from gradual deterioration due to natural ageing or poor storage and housing, to actual loss and breakage (to which glass slides, by their nature, are particularly susceptible). 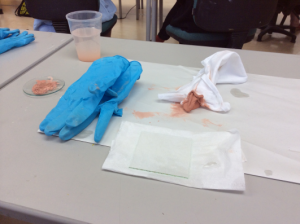 It was beneficial, therefore, that part of the course was dedicated to interventive ‘practical’ treatment options that could be carried out, with particular reference to the more vulnerable glass plate slides. This included polishing replacement cover glass (a rather messy process), which is in important step to ensure that any glass that is to come into contact with the photographic emulsion layer is completely clean and free of dirt and residue. 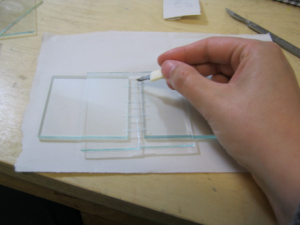 We also had the opportunity to undertake different methods of repairing cracked or broken glass slides using various adhesives. 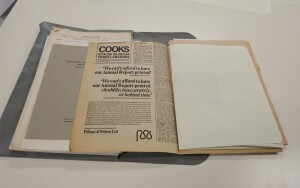 However, when it comes to caring for photographic collections, preventive measures are a far more favourable approach. Adopting correct storage, housing and environmental conditions (as discussed in our previous conservation blog post) can slow down the rate of deterioration, and ultimately reduce the need for more interventive conservation treatment further down the line. These measures can be particularly important when dealing with the more volatile photographic materials such cellulose acetate film. Upon degrading, this film material can suffer from the aptly named ‘Vinegar Syndrome’ due to its propensity to release acetic acid resulting in a distinctively strong odour. Photographic techniques, for example tintypes (produced by creating a positive image on a sheet of iron), were often inexpensive and easy to produce. They were therefore in popular use at recreational destinations such beaches, promenades and parks, and were often taken on the spur of the moment to mark the day or capture a cherished event. Such photographs were not necessarily intended for longevity, and yet many now form an important part of our shared cultural collections. This may make you look at your own collection of holiday snaps in a different way!